Determining potential thieves and burglars from entering your home is the best form of defence. Left to his own devices a burglar will approach the property which is easiest to break into. By securing our home with adequate locks, alarms and other security devices we can substantially reduce our chances of becoming a victim of crime. Most people believe that it is very expensive to secure a property using electronic security devices such as video intercom is, a motion sensor alarm system, outdoor lighting, alarm systems, security cameras etc etc. And while it is true that you can spend a small fortune on these devices you can also get perfectly workable solutions for a fraction of the price. 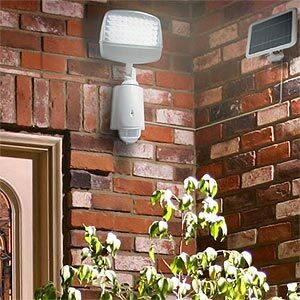 Outdoor security lights, controlled by motion sensor are very cheap. It doesn’t cost much to install them in your home. At the very least you should have one pointing at your front and back doors. They also enhance security in other darker areas around your home, places were a burglar might be able to work at night without being seen. For example the passageway down the side of the house. It is also possible to purchase a home alarm system from a few hundred dollars. The best part about an alarm is the alarm box on the front of the house. This on its own is often worth the money. It’s a very clear sign that you have a home security system. I would say these are the essentials but if you have the budget you can go much further and include wired or wireless outdoor wireless security cameras which send a picture back to a monitoring station in the house. Although these are suitable for some houses they can look silly on tiny properties and can attract attention more than deflected. It is one thing to remember is that even cheaper and simple systems can give you a lot of protection, much more protection than nothing at all.